Canada’s wheat crops held up to a scorching drought and snow deluge better than analysts expected. 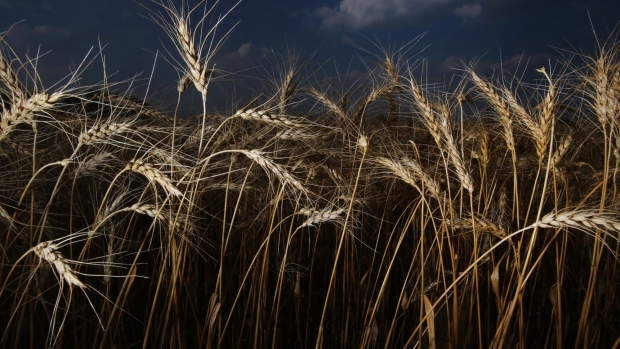 Output of wheat in the nation, one of the world’s top exporters, will rise 6 per cent from a year earlier to 31.8 million metric tons, Statistics Canada said Thursday in a report. The new forecast, a turnaround from its prediction of a 3 per cent drop back in August, also exceeded the average estimate of 31.5 million tons in a Bloomberg survey. Earlier in the season, swaths of the prairies were parched amid below-average rainfall, leading to estimates that both wheat and canola production would tumble amid reduced yields. Farmers were dealt more bad weather when unusually wet, cool weather slowed harvest and snow damaged crops in some areas. While yields in the parts of the southern prairies were impacted by dry conditions, farmers in northern areas that managed to get enough moisture collected “spectacular” wheat yields as high as 90 bushels an acre, Ball said. Canola yields did suffer more from the hot, dry weather and the final production number may be supportive for prices, he said. The agency said it sees canola production falling 4.6 per cent. While that’s lower than analyst expectations, it’s a smaller decline compared with the initial government forecast released in August that called for a 10 per cent drop. Canola futures rose as much as 0.5 per cent to $487.10 a ton, the highest since Nov. 2. Despite the dry conditions, increased precipitation in some regions in late July and August helped crop growth, Statistics Canada said. Still, snow and cold temperatures that delayed harvest may have affected the overall quality and quantity of the crop, according to the report. The following table is a summary of field crop in Canada, as reported by Statistics Canada. Level figures are in thousands of tons.